The question has caused me and countless others many a sleepless night (OK, many a fruitless hour) for the better part of three years: Why in the name of Steve Jobs does every picture of every iPhone in every Apple ad show the time as 9:42. We here at Buzzblog did our best to answer the riddle back in June 2007 by dutifully asking the Apple public relations department for an explanation. A spokesperson told me she would "try to find an answer," but, alas, she tried and failed. I moved on, reluctantly. Fast-forward to yesterday and a blog post by Jon Manning, lead developer at Secret Lab, which makes software for the Mac, iPhone and iPad. 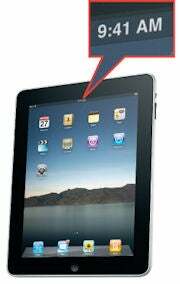 Manning noticed two things of importance on Saturday: first, that the iPad shows a time of 9:41, not 9:42; and, second, that the fellow standing over there in the Palo Alto Apple store appeared to be Scott Forstall, senior vice president of iPhone software. "We design the (product launch) keynotes so that the big reveal of the product happens around 40 minutes into the presentation. When the big image of the product appears on screen, we want the time shown to be close to the actual time on the audience's watches. But we know we won't hit 40 minutes exactly." "So you add a couple of minutes?" Now, it should be noted that others had speculated as far back as 2007 that the time in the photos was somehow related to the time of the initial iPhone announcement. However, this is the first I've heard of Apple looking to synch that time on the pictures with the time on the watches of audience members ... and that the practice has been extended to the iPad. Thanks, Jon, for asking ... and, thanks, Scott, for answering. 2010's 25 Geekiest 25th Anniversaries. I have absolutely nothing to say about the iPad. Google cracks animal translation riddle ... for Android. Clever video technique shows there really are two sides to any story. A new take on cloud security ... from Hitler. 48 technology "firsts" that made a president's day. 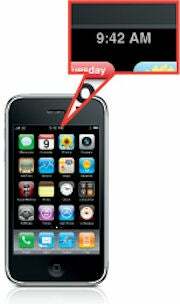 This story, "iPhone Mystery Solved: Why Time Stands Still at 9:42" was originally published by Network World.